The Square Napkin Nantucket Basket is a classic yet contemporary Nantucket Lightship Basket one can use every day! Perfect for those elegant dinners. Hand-crafted featuring a beautifully grained cherry wood base, which has been routed on the inside and outside edges for a decorative and elegant look, hand-tapered and beveled cane staves, tight cane weaving and traditional natural rattan reed rims. The shape is based on a vintage Nantucket basket originally crafted by Jose Reyes, who also made square Nantucket Lightship Baskets. 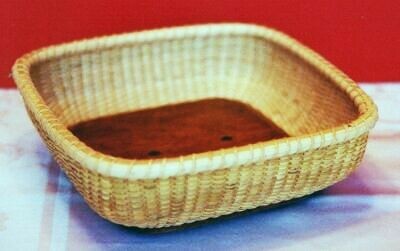 As are all of my Nantucket baskets, this Nantucket Napkin Basket has been given multiple coats of varnish to protect the basket during daily use, and will be signed and dated on the base. The Nantucket Lightship Napkin Basket measures 8" square by 2.5" high at rims. Although I am no longer accepting orders for the Nantucket Basket Square Napkin, I do craft one or two of these per year. When available for sale, you can purchase it directly from my Simply Baskets website.